Luxury Champagne presentation gift set. Quality French Champagne and 2 cut crystal Waterford celebration flute champagne glasses. A pair of Waterford Crystal Toasting Flute Champagne glasses and a bottle of quality French Champagne presented in a luxury silk lined wooden gift box. Ideal to give as a Celebration Champagne gift and a popular Corporate Champagne and glasses gift set. Waterford Lismore Toasting Flute Champagne glasses - Tall elegant design of quality crystal Champagne glasses with the iconic Lismore cutting. The Champagne will either be Moet and Chandon or Montaudon both of which are high quality champagnes. 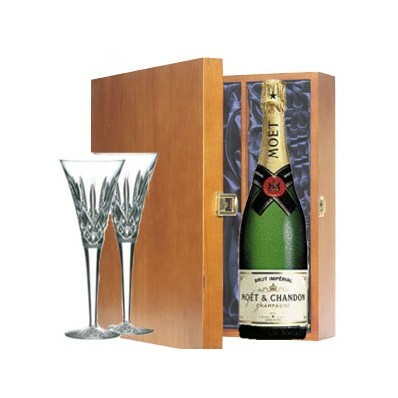 To personalise this special champagne gift set we can apply an engraved brass plaque to the box. Prices start from £12.50 depending on the engraving.